In which I dare to perform rehab on a creative re-imagining of the Moscow Mule by Cocktail Courier. And manage, against all odds and much failed experience, to pull it off. 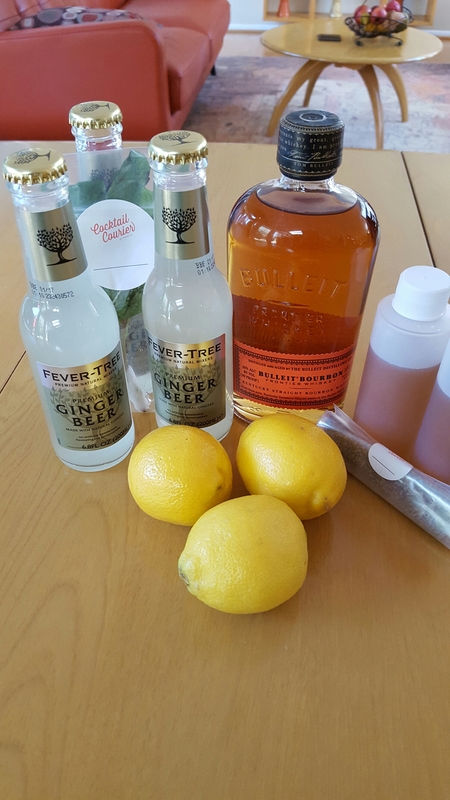 Think of Cocktail Courier as a Blue Apron for drinks: All the ingredients for a new drink, including the booze, delivered right to your door by a cheerful, if slightly curious, FedEx driver. The drinks are originals dreamed up by members of ShakeStir, an online hang for professional barfolk. Members compete to create new drinks for Cocktail Courier. This month’s winner: Old Peppersass, an original spin on the Moscow Mule imagined by Paul Tanguay of the esteemed Tippling Bros. in NYC. Everything you need to make an Old Peppersass, a Cocktail Courier original: Bourbon, pepper syrup, lemons, and mint. Oh, and ground pepper. nb: FT is the brand to use, always: Spicy, tangy with ginger, with way more “tooth” than Goslings and other cheaper brands. Shake all ingredients but the ginger beer, including mint leaves. Strain into Collins glass, fill with ice, top with 2 measured ounces of Fever Tree. Don’t just “top it off,” as you may water it down. Resist your “WTF?” intuitions and garnish with a pinch of black pepper. A creative re-thinking of the Moscow Mule — though barely recognizable as one and not, frankly, a great drink. Tanguay swaps the vodka for bourbon, lime for lemon, and adds the unexpected…sass of black pepper. All that’s left of the Mule bones is ginger beer and citrus. The syrup dulls the sharp tang of the ginger beer, sending this drink to places it shouldn’t go. Shaking with mint embeds into the body of the drink the minty notes of what’s often used as a garnish on the mule. Not a bad thing, but this may be the flavor-too-far. The pepper garnish is an awesome touch — adds some heat to the nose. The New Peppersass, with more pepper, less sweetness, and a bit more booze. I got rid of the mint and re-installed it as a garnish, then finally got rid of it completely. I goosed the Bulleit, bringing it to 2 oz. I disposed of all but a quarter ounce of the pepper syrup. Instead I twisted some ground pepper into the shaker, shook the thing like a wildman, then quadruple-strained through a fine mesh strainer. I filtered out nearly all the pepper grains. It worked! My gambits eliminated the gratuitous sugar but kept — actually intensified — the pepper vibe. The result was a boozy mule in which the pepper played with the lippy tang of the ginger beer. The novelty of the pepper garnish gives it a playful, slightly brave edge. The cool thing about this modified version — call it the New Peppersass, with apologies to Tanguay — is that it’s easy to make at home: bourbon, lemon, pepper, Fever Tree. A touch of simple syrup to replace the pepper syrup. I’ll add this to my repertoire as a summer relaxer with a slightly hot twist. The reason I love Cocktail Courier is that it introduces me to ideas and approaches I’d never think of otherwise. And there’s a certain gratification — okay, vanity — in trying to improve the work of a great mixologist. Oh, and the drinks come out to cost about $6 each — happy hour prices, delivered directly to your door. No Uber needed!